In approaching a design for this project, I wanted to find a visual metaphor to symbolise the great love and respect the British people have for Queen Elizabeth II, our longest serving monarch. There are so many ways in which we can celebrate her reign artistically, and my initial thoughts included perhaps her portrait, the symbols of state and of the Commonwealth. However, I wanted to find a more poetic and lyrical visual representation and I chose the Queen Elizabeth Rose, a beautiful and fragrant Grandiflora which was created in 1954 to mark the Queen’s Coronation in 1953. This image perfectly reflects the grace and longevity of her reign, and speaks of the esteem and great affection in which the British people hold the Queen. 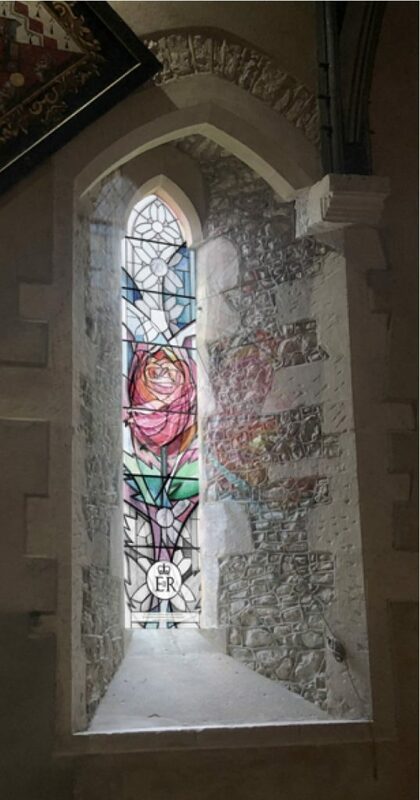 The design has been created to harmonise with the existing stained glass in church by utilising the geometric background and border motifs of the adjacent windows and combining them with the central images of the Rose and the Royal Cypher of Queen Elizabeth II. The inscription along the bottom of the design reads “In thanksgiving for the service of Queen Elizabeth II, our longest serving monarch.” This can be amended in due course with dates. The window is to be made using traditional techniques of hand painting pigment onto antique glass, etching and staining of glass, and traditional leading to ensure the new window harmonises and compliments the existing glazing scheme. Supporting non ferrous saddle bars are to be installed into the stonework using traditional lime mortar and an opening ventilator is to be incorporated into the window. This design is an uplifting and colourful celebration of the reign of Queen Elizabeth II, and is both contemporary in style and complimentary to the existing historic glass in church.